The water sinking at Gaping Gill emerges at Clapham Beck Head, but it hasn’t always been that way. 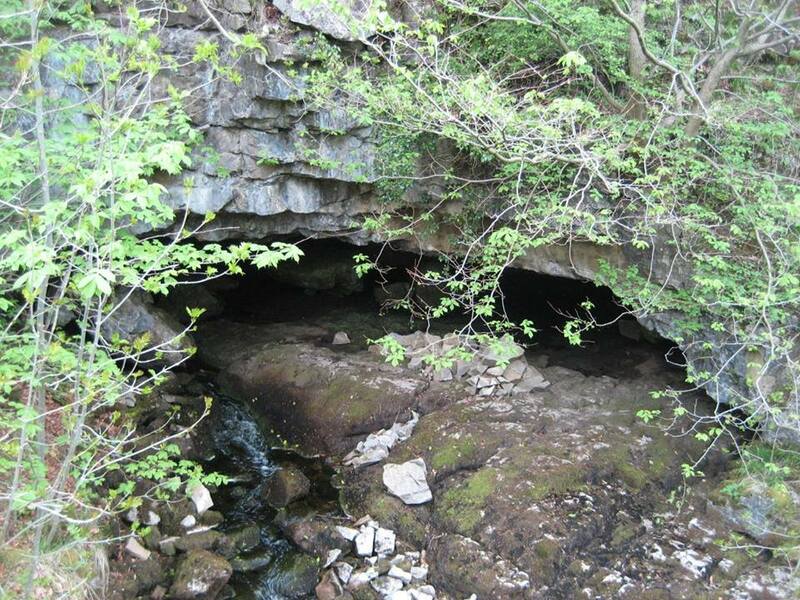 Ingleborough Cave – or Clapham Cave to some – is a former resurgence that was abandoned when the Gaping Gill water found a new, lower route. Until 1837, the spectacular entrance led just a few yards to the anti-climax of a large stalagmite barrier known as ‘The Bay’- holding back a deep lake. 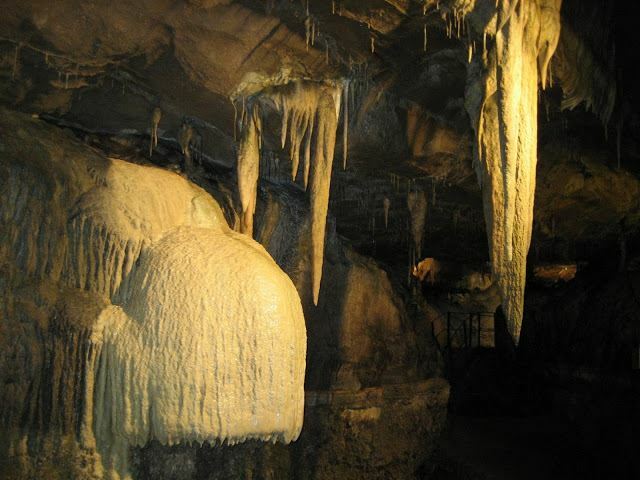 In September of that year, James Farrer’s curiosity got the better of him, and with gunpowder and trepidation he broke through the barrier – revealing a truly beautiful arrangement of stalactites and flowstone features, since visited by thousands of equally curious tourists. Presumably, James broke through a bit at a time: it is easy to get the impression of him and his cronies being washed away in true ‘Laurel and Hardy’ fashion! 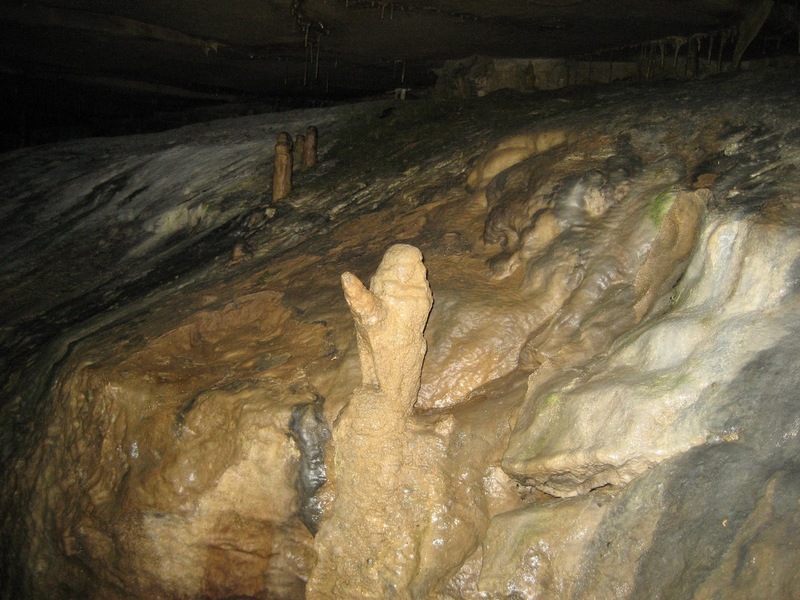 Entering the cave, the old water level can be seen clearly along the walls, and the feature known as the ‘Beehive’ displays a small ‘frill’ of flowstone that has grown below the limit of the former water surface since that time. 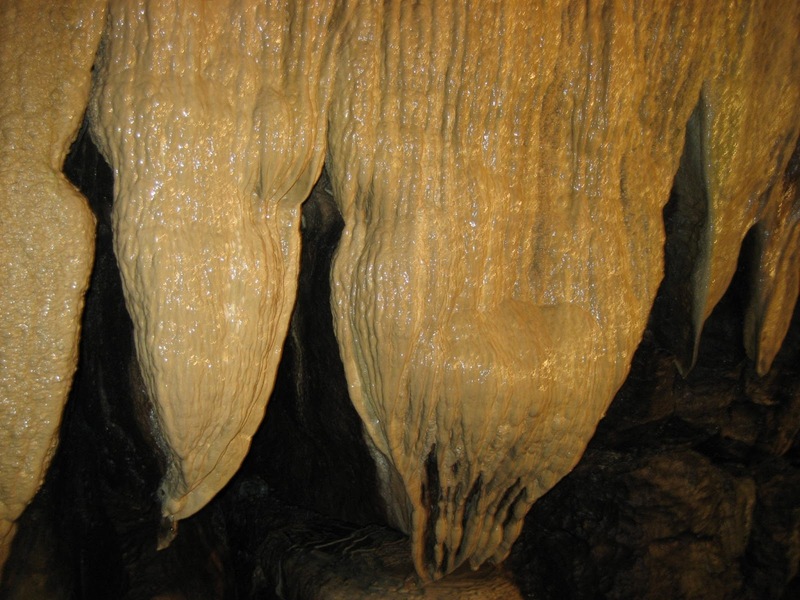 Stalactites that were once limited by the lake can be seen to have developed outwards in a bulbous fashion, resembling topsy-turvy Christmas trees known as ‘The Inverted Forest.’ Close to the Beehive is a magnificent stalactite, over seven feet (two metres) long – a ‘Sword of Damocles’ that dwarfs its counterpart in White Scar Cave. 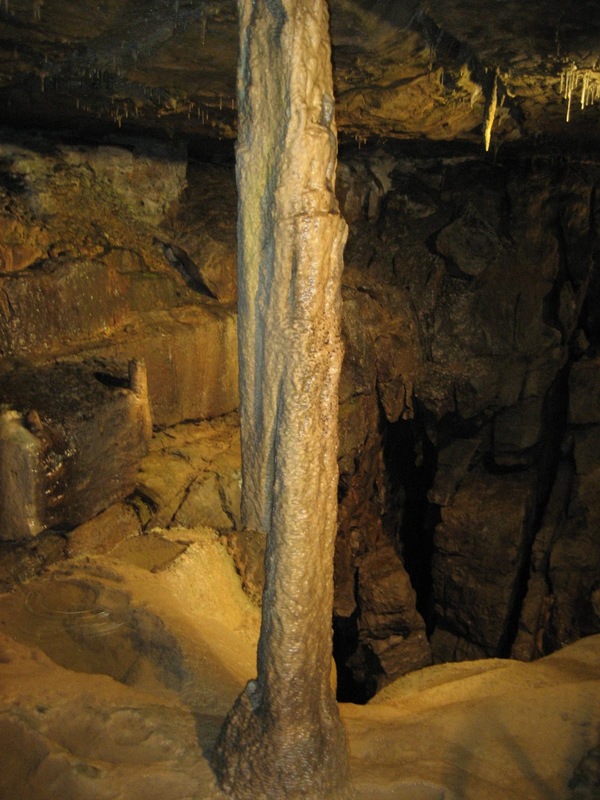 Again the old water level limited the downward growth, which is now increasing – making the calcite be deposited outwards to make this one of the finest stalactites in Britain. Eldon Hall (named after Viscount Encombe, Earl of Eldon – who explored the cave with Farrer) leads beyond the Sword of Damocles to Pillar Hall, named for an impressive column that joins floor to ceiling. Close by, a tiny stream sinks into a pothole in the floor known as ‘The Abyss’ – which eventually emerges at Clapham Beck Head. 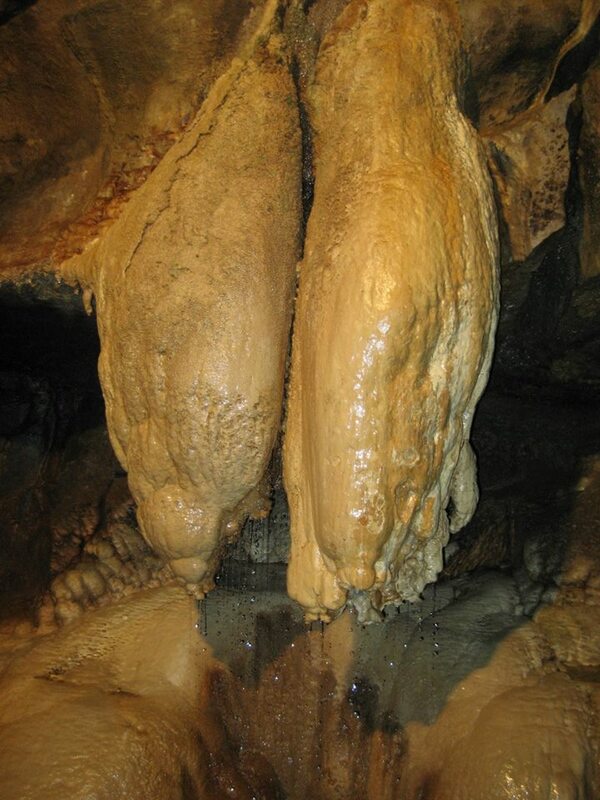 The show cave then continues to the ‘Showerbath’ or ‘Queen Victoria’s Bloomers’ – two huge bulbous and joined stalactites with a flow of water between them. The beautiful flowstone drapes of the ‘Curtain Range’ lie beyond, and, after a low section needing tall people to seemingly bend in two, the visitor emerges with ‘The Gothic Arch’ on the right, through which can be glimpsed a mass of stalagmite known as ‘The Lady’s Cushion’. The Long Gallery finally leads through the aptly named ‘Skittle Alley’ to the ‘Pool of Reflections’ and the limits of the present day show cave. 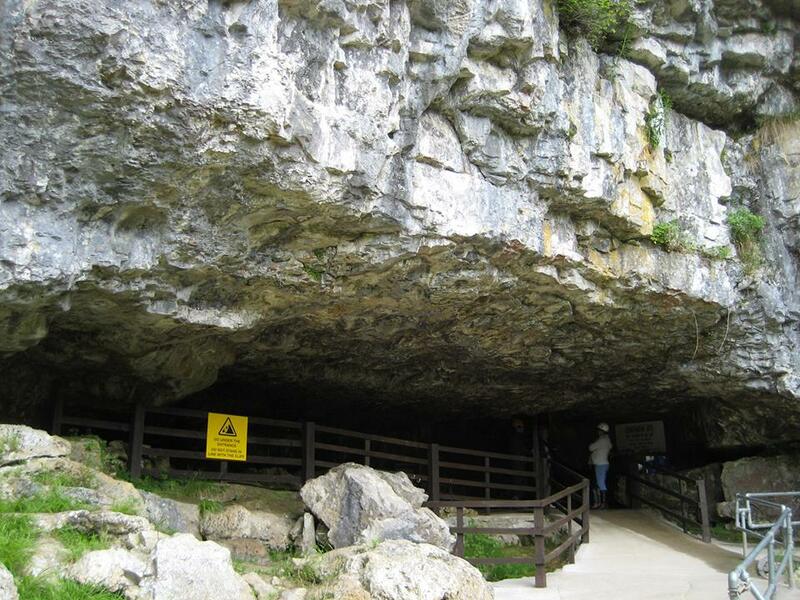 The passages beyond this point have long-since fascinated cavers. Cellar Gallery has a squelchy pool in the floor known as ‘The Styx’, formed after a great flood in 1872 when the floor of the passage was effectively scooped out. 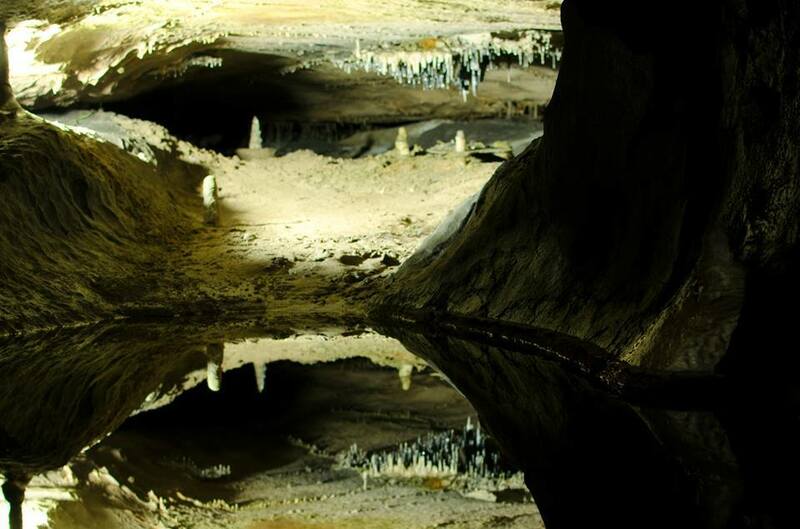 A crawl than leads into Giants Hall, through which is a long canal christened ‘Lake Avernus’ – the limit of Farrer’s exploration. A sandy crawl below Giant’s Hall meets Fell Beck, the original stream that formed Ingleborough Cave – now flowing in its ‘new’ route towards Clapham Beck Head. One hundred and forty-six years after Farrer’s adventures, cave divers forced a route through to the Gaping Gill passages in 1983, widening the underwater gap so an exchange trip could be made. The original link was so tight that it involved Gerald Benn’s hand grasping Geoff Crossley’s ‘wellie’ through a tiny hole! Fell Beck rumbles through mainly submerged passages on its way to daylight at Clapham Beck Head, but a vadose canyon incised in its floor for 400 metres forms Beck Head Stream Cave (SD754711) with the spectacular Broadbent Falls. 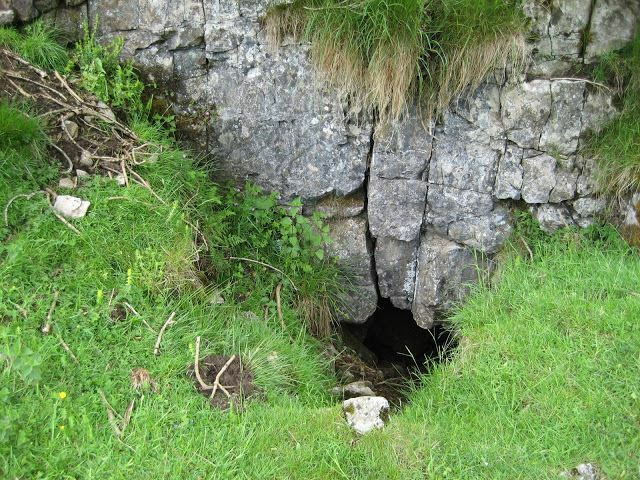 These are for experienced cavers only and can be accessed via a small entrance in the valley side just a short distance beyond Ingleborough Cave itself. This usually involves the delightful experience of sliding in backwards and not knowing where your feet are heading, but the spectacular underground river beyond is well worth the effort in settled weather. 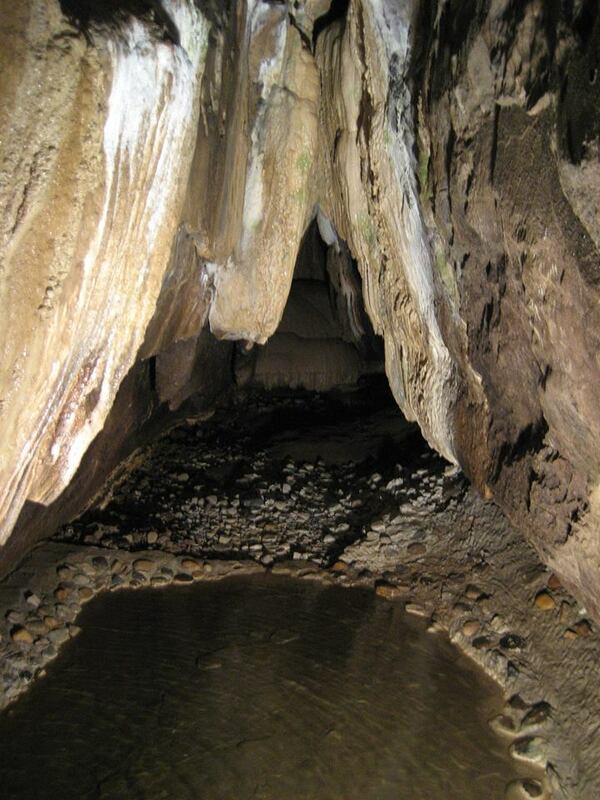 The link between Gaping Gill and Ingleborough Cave was first proved as far back as 1902, when The Yorkshire Geological Society placed a ton of ammonium salt in the great pothole, detecting it at Clapham Beck Head an incredible five days later, though this is reduced to a few hours in high flood. Even today, parts of the water’s journey remain unknown. Some secrets are probably best left to intrigue us.